There are many things to love about the tequila sunrise. It is easy to mix up at a moment's notice, it is beautiful to look at, it is a refreshingly fruity cocktail, and, of course, there's tequila! While it is a great cocktail, the orange juice and grenadine version that is so popular is not the original. If you want a taste of the first tequila sunrise, you'll need lime juice, creme de cassis, and club soda. It is equally delicious and includes that signature "sunrise" effect. It's simply a completely different taste. There is no doubt that the tequila sunrise is one of the most popular tequila drinks. 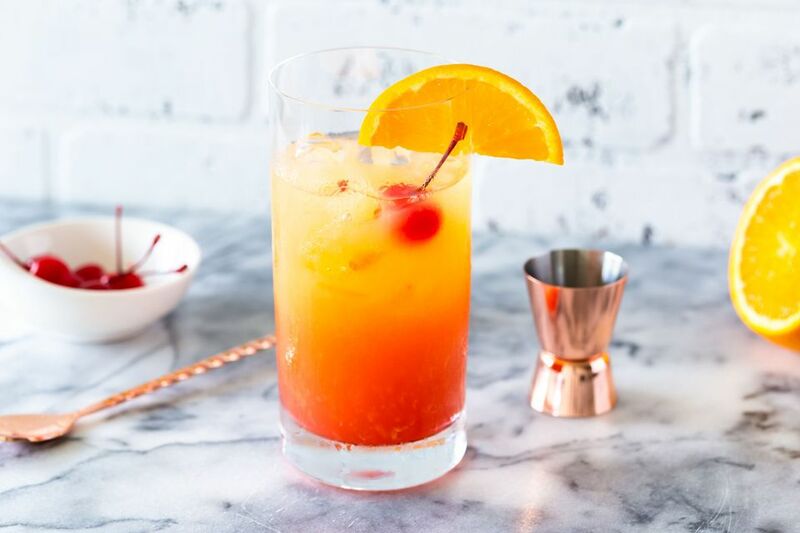 It is also one of the easiest and the layering effect that creates the sunrise happens naturally, so anyone can create this stunning cocktail. The key to the sunrise is to avoid stirring the drink after adding the grenadine. If you stir it, the grenadine will mix with the juice and create a blush pink drink. The grenadine also adds a fine sweetness to balance out the tartness of the orange juice. If you skip the tequila, the virgin sunrise is actually a pretty good way to sweeten up your morning OJ. Either way, it's a fabulous addition to your brunch table. Pour the tequila and the orange juice into a highball glass filled with ice cubes. Slowly pour the grenadine around the inside edge of the glass. It will sink and gradually rise to mix with the other ingredients. Firefly: Vodka and grapefruit juice pair with grenadine for a simple, tart drink. Peach Candy Corn Cocktail: A playful vodka cocktail that's ideal for Halloween. Ruby Rum Sunrise: A tart rum drink with grapefruit juice. Sour Sunrise: A fancier version that features bourbon whiskey. Sparkling Peach Sunrise: A delicate mocktail featuring peach juice. Tequila Sunrise Margarita: Yes, there is a margarita for everything and this blended beauty is quite fun. Waterloo Sunset: A drink that mixes gin, elderflower, and Champagne with a raspberry-flavored sunrise. The original tequila sunrise is sparkling, light, and featured creme de cassis. At some point, it was simplified or completely altered (depending on how you look at it) to the recipe above. The constants have always been the visual sunrise effect and the tequila. Creme de cassis is a blackcurrant liqueur with a deep red color that is used in a few cocktails, most famously with wine in the kir and vermouth cassis. It works very well with tequila and is easy to find at the liquor store. While you have a bottle open, be sure to mix up the chimayo and el diablo cocktails as well. To make this drink, pour 1 1/2 ounces tequila and the juice of 1/2 lime into a collins glass filled with ice. Top with club soda, then slowly pour 3/4 ounce creme de cassis into the drink. Garnish with a lime wheel and maraschino cherry. There are a few stories behind the origin of the tequila sunrise. As with most cocktail histories, things get a little cloudy at times and it's hard to know which story to believe. In all likelihood, the Arizona Hotel and Trident Restaurant stories are the most plausible. One story claims that the drink was used to welcome tourists to Cancun and Acapulco in the 1950s. Another story gives credit to Gene Sulit who tended bar at the Arizona Hotel in the 1930s and 40's. Another attributes it to Bobby Lazoff and Billy Rice, bartenders during the tequila craze of the 1970s at the Trident Restaurant in Sausalito, California. It's said that this is where the drink may have turned into the popular orange juice version. How Strong Is the Tequila Sunrise? Assuming that you pour an 80-proof tequila and end up with a 7-ounce drink, the alcohol content of either recipe will be around 11 percent alcohol by volume (22 proof). You can pour as much tequila or as little juice and soda as you like to make either stronger or weaker. However, it will almost always be a rather mild cocktail.